Mahasthangarh is one of the oldest and the most important archaeological attractions in Bangladesh. ‘Mahasthan’ means ‘great sanctity’ and ‘garh’ means fort. Mahasthangarh is the remains of the ancient city of Pundranagar. It was the capital of the Maurya, Gupta and Sen kingdoms. Over the centuries, the site was home to Muslims, Hindus and most importantly Buddhists. The Buddhist Pala emperors of North Bengal ruled over this region from the 8th to the 11th centuries and it is from this period that most of the visible remains belong. Amongst the ruins, a few relics still stand tall and command attention, and the rural setting is incredibly peaceful. It is located at a distance of 18 km north of Bogra town. 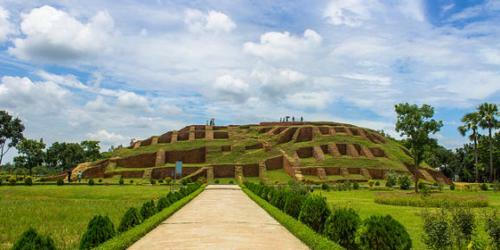 It is the oldest archaeological site of Bangladesh on the western bank of river Karatoya. The spectacular site is an imposing landmark in the area having a fortified enclosure. Beyond the fortified area, other ancient ruins fan out within a semicircle of about 8 km radius. Several isolated mounds Govinda Bhita Temple, Khodar Pathar Bhita, Parsuram’s Palace and Jiyat Kunda surround the fortified city. This 3rd century BC archaeological site is still held to be of great sanctity by Hindus. Until recently, thousands of Hindu devotees joined the bathing ceremony on the bank of river Karatoya every year (mid-April). A visit to the Mahasthangarh site museum opens up a wide variety of antiquities, ranging from Terracotta objects to gold ornaments and coins recovered from the site. This ancient archeological and historical site, established around 2500 BC, is located at Shibganj upazila of Bogra district. It lies on the western bank of Korotoa River, about 13 km north of Bogra city on the Dhaka-Dinajpurpur highway. It is believed that the rulers of the Maurya dynasty founded the city. It is the earliest evidence of urbanisation in ancient Bengal. A broken limestone slab from the 3rd century BC that bears six lines in ‘Brahmi’ script has been found there with the name ‘Pundranagar’ inscribed on it. The entire area is surrounded by a fortification wall. The oblong enclosure measures 1,525 metres by 1,370 metres, with an average height of 5 metres. Evidence has been found at the site of successive Hindu, Buddhist and Muslim occupation. The Buddhists were there at least until the 11th century. Their most glorious period was between the 8th and 11th centuries, when the Buddhist Pala emperors of North Bengal ruled. Beyond the fortified area, there are some other ancient ruins within a semicircle of about 8 km radius. 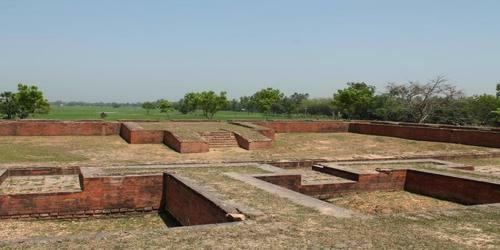 Various mounds and monasteries (bihar) are scattered throughout the vast area outside the fortification wall. Among them, Bairagir Bhita, Govinda Bhita, Khodar Pathar (stone of God) mound, Mankalir Kunda mound, Parasuramer Prashad Mound, Jiyut Kunda (Well of Life), Godaibari Dhap, Noropotir Dhap, Gokul Medh (Lokhindorer Bashor Ghar), and Bhasu Bihar are mentionable. Bairagir Bhita – palace for women – hermits, built in the 4th – 5th century AD. Jiat Kunda – well which, according to legends, possessed life giving power. According to legends dead soldiers were revived with its water during the fights. Khodar Pathar Bhita – Buddhist shrine. Munir Ghon – impressive bastion. Parasuramer Basgriha – palace of king Parasuram, in use from 800 AD to 1800 AD. Govinda Bhita – temple of Govinda is located to the north-east from the city walls, at Karatoya river. This is ancient building, possibly from the 3rd century AD, although here have been found artefacts from the 3rd century BC. Mazar – holy tomb of Shah Sultan Balkhi Mahisawar with later built mosque next to it. This structure is located at the south-eastern corner of citadel, in the site of an ancient Hindu temple. Gokul Medh is located some 3 km south from the citadel. This Buddhist monastery belongs to most impressive archaeological sites in this area. This enormous structure was excavated in 1934 – 1936, when 172 rectangular blind cells were exposed. Gokul Medh was built in the 6th – 7th century AD. On the top of this approximately 13 m tall structure was standing stupa which is lost now.